In an interview granted to French television and published by the daily newspaper ?Le Révélateur? 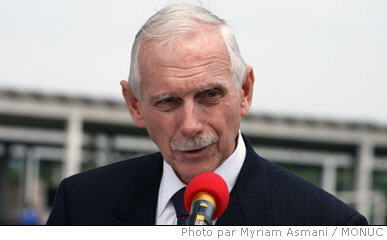 in Kinshasa, this Tuesday, July 8, 2006, the head of MONUC, William Swing, clarifies the electoral process and asks the Congolese to be patient while waiting for the official results of the elections. Why are the Independent Electoral Commission (IEC), the High Authority of the Media (HAM) and MONUC opposing the publication of the results posted in front of the polling stations by the press? One cannot extrapolate the results of only one polling station among 50 thousands in order to designate a winner or a loser. The publication of the results must wait a few weeks owing to the fact that there are 50 thousand polling stations scattered all over the RDC. We all said from the very start that nobody should announce his or her victory or talk about fraud before the IEC and the Supreme Court of justice have the occasion to act according to their mandate which is assigned to them by the electoral law. Yes, there were certain irregularities, as in any country of the world. But a distinction should be made: it was the IEC in the first place who denounced these irregularities before anybody else. That?s why we called people to keep calm and to be patient. The IEC will publish the results on the appropriate moment. But when the IEC allows that the polling stations post their results, doesn?t this mean that there is already an official announcement to the population? Yes and no! It is very important in terms of transparency that, in every single of almost 50 thousand polling stations, the international and national observers, the witnesses of the political parties as well as the population in general can see the counting to make sure that it is correct, that there is neither cheating nor fraud. It is important, but you should not confound this procedure and the compilation process. One cannot extrapolate the results of only one polling station among 50 thousands in order to designate a winner or a loser. Compilation results should be awaited. And for this task the IEC is the only competent body. One should not forget that the IEC had to train 260 thousand campaign organizers who work in the polling stations in order to ensure a good course of voting operations, including security. As the n°1 at MONUC, you chair the International Committee for Support to the Transition (CIAT) which often meets with the ?espace présidentiel?. And as for the election, we are witnessing a duel between Kabila and Bemba. What have you done so far to approach these two personalities, the only ones in the position to control this effervescence, to control their respective partisans and their television channels, and the very first to publish these results? We are here to support a credible electoral process that offers an electoral system for the future. You are asking a key question since even if they are candidates, the president and the four vice-presidents made a solemn promise on 30 June 2003: to make the transitional government work until the new government is in place although this was more difficult for them during the electoral campaign. The Congolese people will insist on that the government has to continue functioning and that the CIAT do their best to encourage the ?espace presidential? to keep on working together and discussing regularly. In particular with the CIAT, because we are here to help this process and to support it. They absolutely have to stay together and, in this spirit, we already started the discussions with all the five of them. Do you really have the impression that this effervescence can create a disturbance of law and order to the country? Not at all! We believe that the Congolese prudence will prevail. The Congolese have been waiting for a very long time to have a good election. We have great confidence in the Congolese people. The Congolese want a result, which will not be found on the street. They want to see a new government installed. We think that everyone realized that there is only one process as that of the transition which can guide the people to a period of peace, prosperity and democracy. We are not afraid for that. Questioned on the great interest which they grant to the results, the population says that this is by precaution, because the International Community wants to impose on them a candidate that is favourable to them. The population wants to be able to check whether the results posted by the offices were respected. Then, there is a problem of credibility, a loss of confidence. What is your point of view on that? I believe that the opposite is true. The papers that circulate in Kinshasa do not have any validity. The IEC?s results should be awaited. Why would someone invest hundreds of millions of dollars here? It is to help the Congolese people to have a good election. We are here to support a credible electoral process that offers an electoral system for the future. One should keep in mind that on October 29, we will have at least the elections for the provincial parliaments and the second round for the presidential elections, if there is one. Approximately six months after the installation of the newly elected government, there will be local elections. We prevent that people receive false information and are disappointed. It is necessary to wait and be patient. This is not asking too much after 15 years of transition when we say: "Keep on waiting for only a few more days, a few more weeks." The final and official results will arrive.